Having asked a foodie friend of mine not too long ago where one might find a decent restaurant in the Holborn area, her reply was dismissive. It’s a desert said she for decent food options. Disappointed was I, but I thought little more of it. That was until a friend told me that he was swinging by London on the road to Iraq from New York and would be in town for a couple of hours, so where could we meet for lunch. Taking a look at the Piccadilly line tube map, I sought out a stop not too far from my work place, within easy reach by bicycle yet not too far from Heathrow. Holborn seemed a suitable compromise, and by compromise I do of course mean it suited me best. 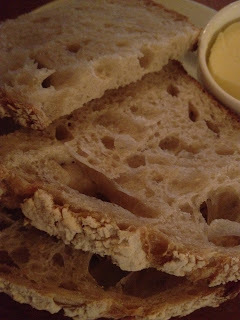 Having found a neutral ground, it was to my Michelin guide 2012 I went to for inspiration. It was to Great Queen Street I sought solace, a gastropub originally name given that it’s located on Great Queen Street a stone’s throw from Holborn. It’s a New Bib Gourmand and therefore seemed to be a good option to check out. Upon arrival and having referred to the menu at the airy venue, I noted that the restaurant is of the same family as The Anchor and Hope in Southwark and The Canton Arms in Vauxhall, two restaurants I rate highly, each serving up hearty winter fodder with lots of root vegetables on offer and plenty of game. The menu at Great Queen Street did not stray far from this winning formula – duck and partridge featured on the lunch menu. 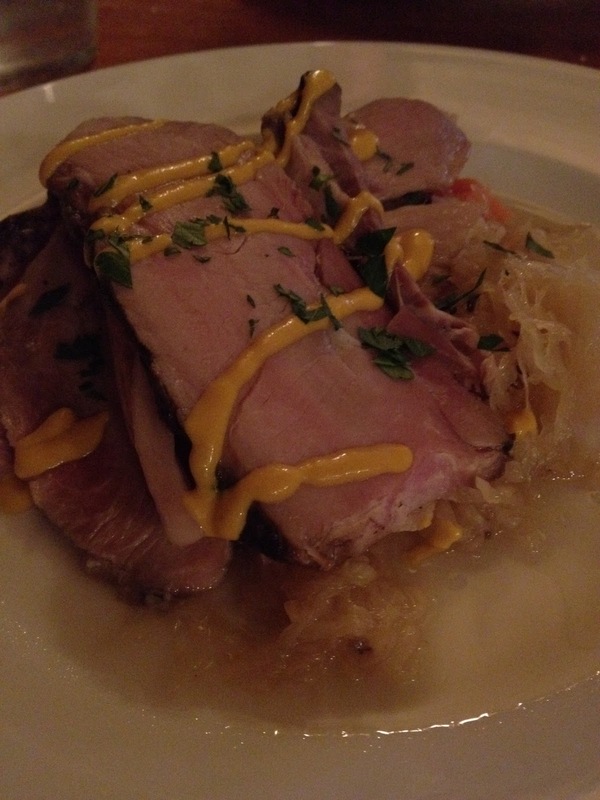 I selected the cider ham served with apple and choucroute. When it arrived, I realised choucroute is simply French for sauerkraut. The ham was delicious and was dressed with some mustard. The sauerkraut was tasty and the apple subtle not at all overpowering. I used the bread brought to the table to mop up the soup type gravy. The bread at the table was also very nice. 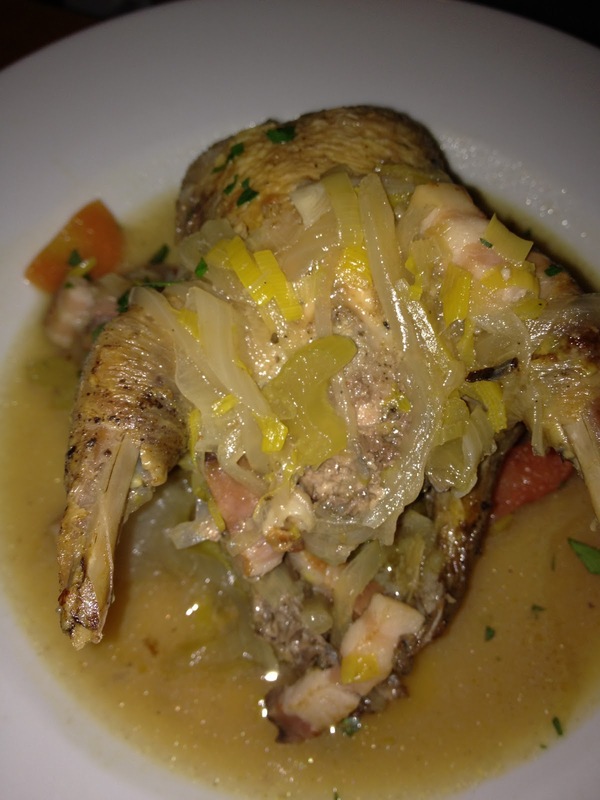 The other lunch chosen for the table was the pot roast partridge with bacon and quince. The waiter made reference to using fingers to get at the partridge. My friend however, decided to use a knife and fork and quickly the partridge along with some bacon and a chunk of carrot arrives on my plate having flown through the air at speed. I would be embarrassed had I any high expectations of my friends. Fortunately I don’t. The partridge was excellent and the taste set off nicely with the quince and bacon. 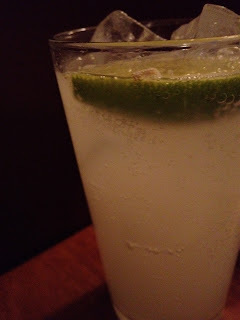 To drink I was swayed by the tempting choice of ginger beer made on the premises. Now I love ginger beer – Fentiman’s is my tipple of choice in the ginger beer stakes. However, the ginger beer was disappointing to say the least leaving a very strange aftertaste. And I mean strange in a bad way. I don’t want this to take away from the lunch however which was excellent. Great quality produce, deliciously cooked, and excellently presented. The desert of Holborn has at least one decent food venue. And at very affordable prices. The mains cost £13.80 and £14.80 respectively, and the unfinished ginger beer £1.90 all before tip. You need to get better friends with better table manners. If you are looking for one, I am flying through London from NYC on my way to Iraq next month. Let me know.